This Web site maintained by Tess Cook with our permission. Three-toed box turtle siblings each one year apart. That is the old woman that takes care of us in the picture to the right. We keep her really hopping with our demands for more worms, fresh water and new shrubs. We hate her shrubs and always dig in the roots and turn the ugly, old things brown and make them die. We want rocks and logs to dig under but the old woman is afraid they will shift and smash us--like we can't handle a little old rock, HA! We box turtles are tough and have done fine without the old woman's or anyone else's help for as long as there's been dinosaurs! Who does she think she is, our mother?! And we don't like the old woman's mouth either. I mean, what are those white things when she smiles? They scare us. Wish she'd lose them. But we do like the fat waxworms and soft, white mealworms the old woman gets for us. I don't think we could pick up a phone to order them ourselves. And I guess we like having the seeds taken out of our fruits, and the nice, warm baths she gives us. But hey, we deserve good treatment because we are the center that the sun revolves around! If we didn't get up every morning, the sun wouldn't come up to greet us. And if we don't go to sleep, that sun would shine all day and make things pretty hot around here. That old woman better not complain the next time she gets the vet bill for our yearly worm screening or we just may sleep in all day and we'll see how she likes walking around in the dark, bumping into things all day! Talk about days, we'll make your day. Here's some more pictures of us and our friends. You have our permission to print them out and look at us anytime you want. Meet more of our friends!! Ornate turtle, Winky in his spa. Teri B. 's gorgeous Eastern box turtle, Francesca. This is sweet, Petey. Read his story. See pictures of box turtle babies. Babies, babies everywhere! 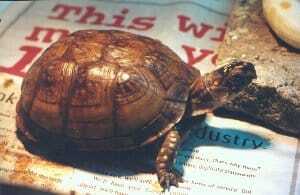 More box turtles of every size and subspecies owned by our friends on the Boxturtlelist. Take a look at these great digs our friends live in. Here are drawings of box turtles and other turtles by our artist friend, Sharon Scheel. Jody's friendly Eastern box turtle, Shelly. I want to thank these folks for some of the graphics on this and other web pages on my site. Disclaimer: Please use all information contained on this web site at your own risk. Last updated on December 30, 2010 .